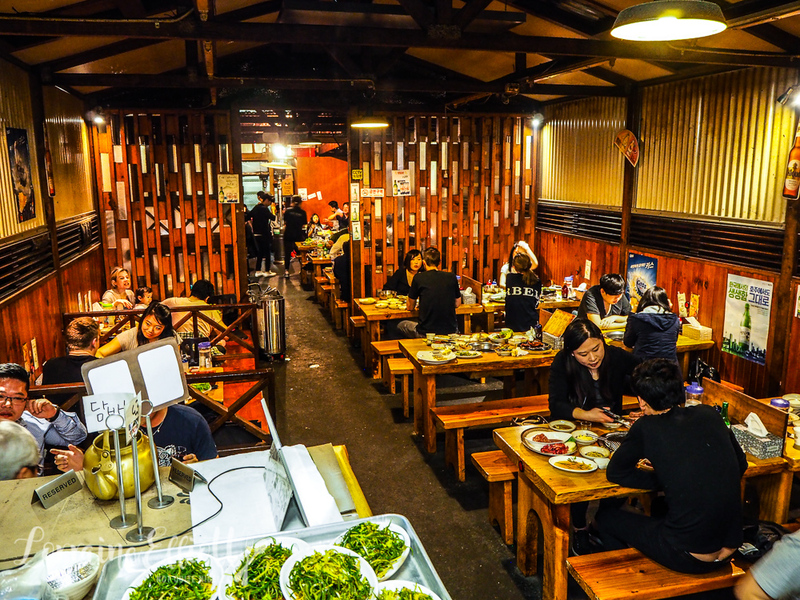 Looking for THE place to go for Korean BBQ in Strathfield? 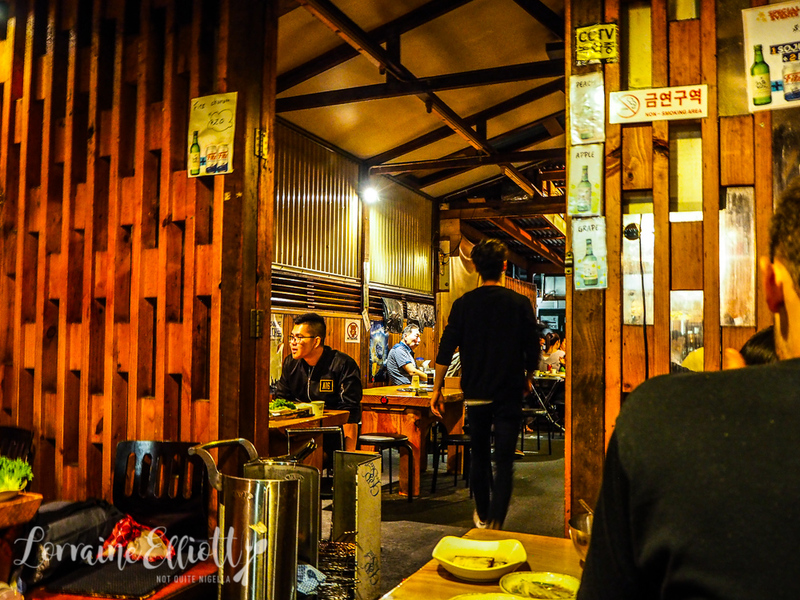 Jang Ta Bal is the barbecue place that everyone in the know goes to. 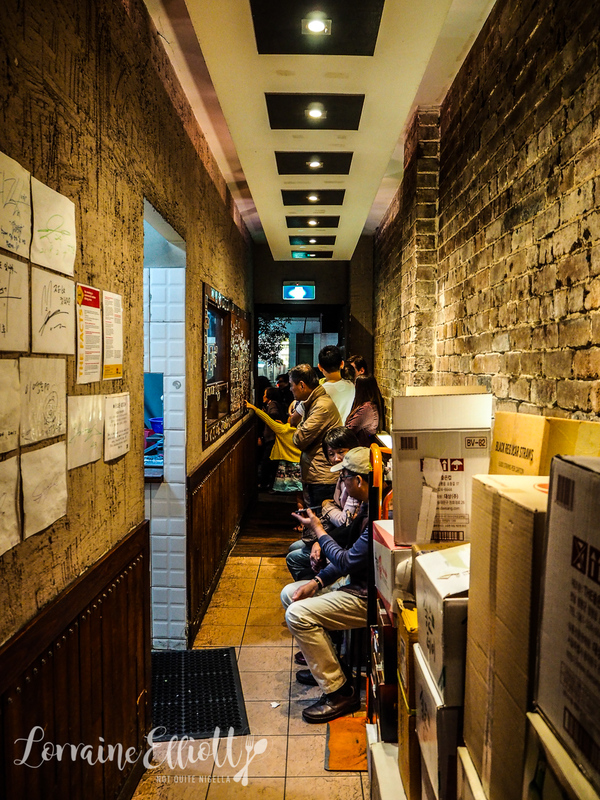 Sure the queues are daunting but that's when you know you've found the spot. 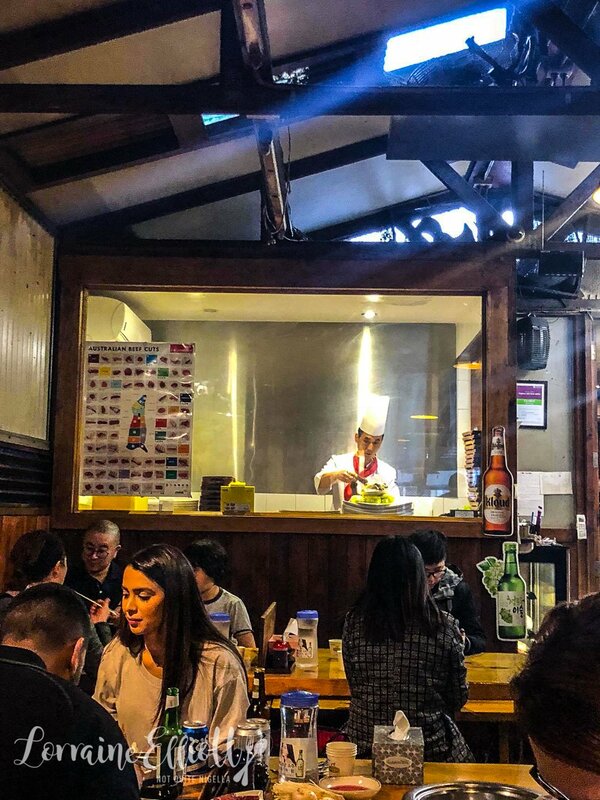 The messages came thick and fast from my Instagram stories when I was at Jang Ta Bal in Strathfield and even though I didn't say where I was, people knew straight away. "Jang ta bal? 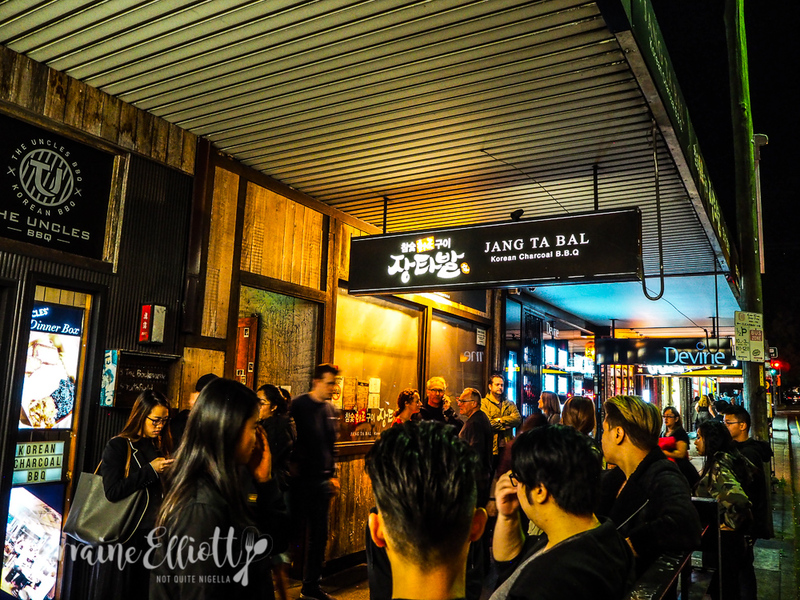 My fave"
"Jang ta bal Strathfield? 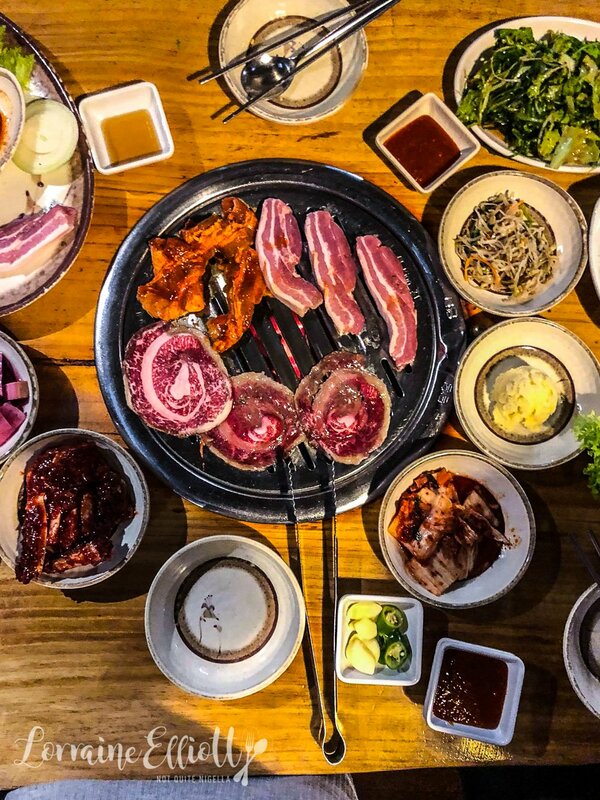 It's the best kbbq!" "Jang ta Bal? 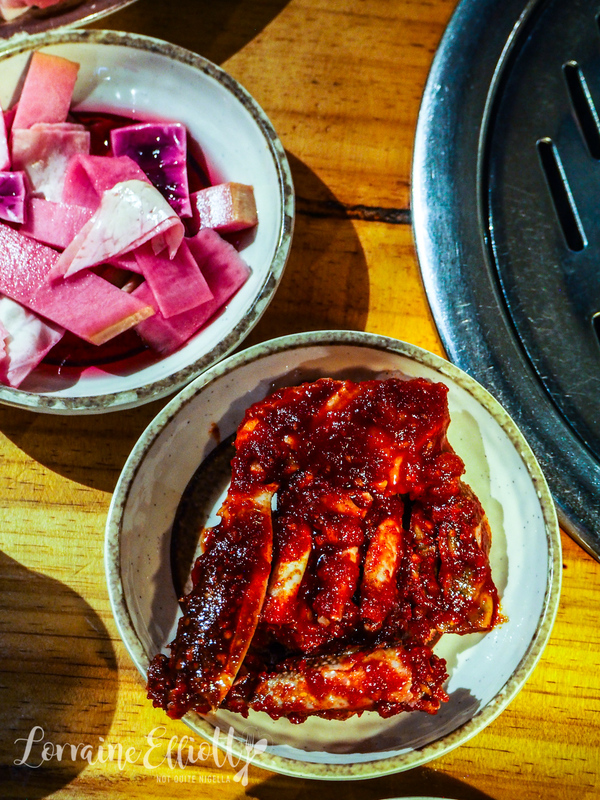 It's THE Korean bbq hotspot"
Although Strathfield is awash with plenty of Korean BBQ places, it's no fluke or coincidence that we are at Jang Ta Bal. Mr NQN and I picked Ivy up at 4:30pm and made our way there to reach there at 5pm. Because unless you get there before 6pm you'll be joining the long queue of people. 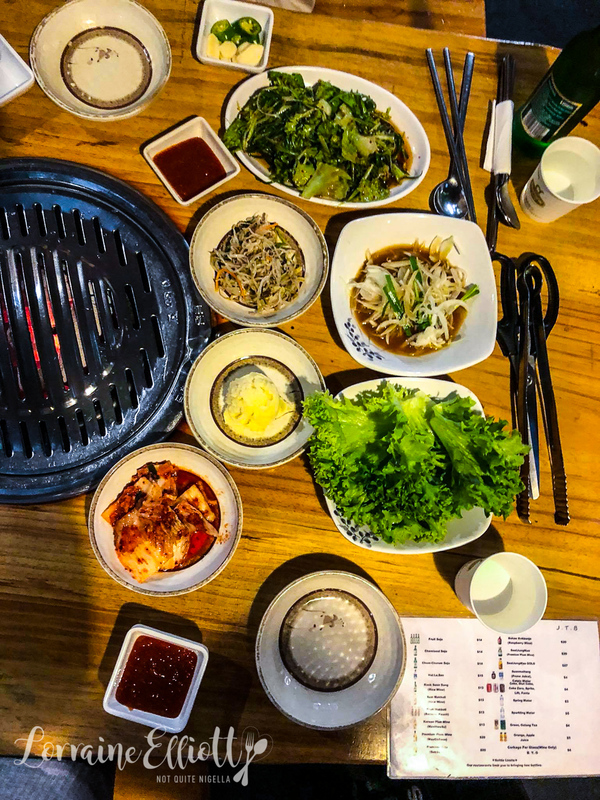 Sure there are sleeker, slicker places - Jang Ta Bal's entranceway is lined with boxes and you walk past the kitchen but the proof is in the patrons. The restaurant is half full when we arrive at 5:05pm. If you arrive at 5:30pm the only tables on offer at the ones where you sit cross legged with your legs under you and by 6pm the queue will have formed. Ivy and I decide on a few things to eat and they bring the hot coals to our table. 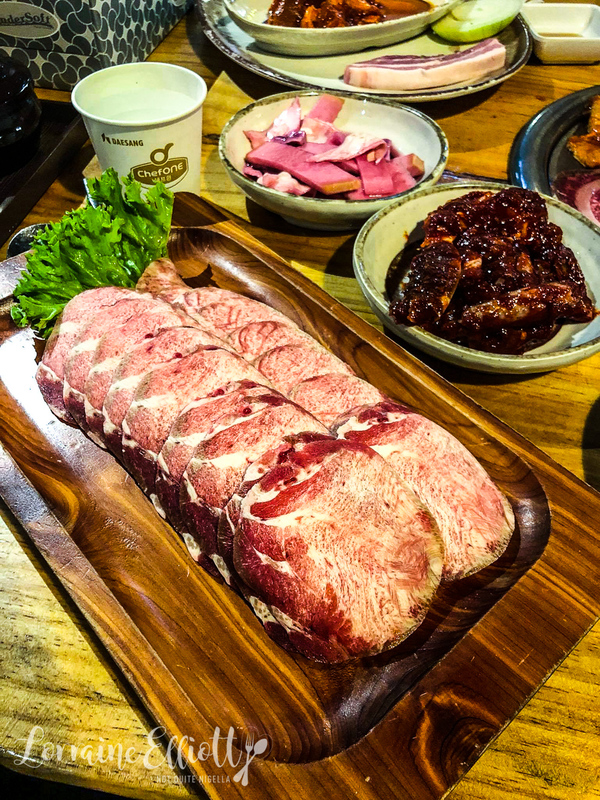 We order a mixed set menu as well as some beef tongue as Ivy has never tried it before, a seafood pancake and a special dish with pork ribs, cheese and ttebokki (chewy rice flour sticks). This starts talk about our favourite meats on the land and sea. Ivy and I twin and declare our favourite land meat to be pork (hers is specifically ham) and sea meat to be prawns. Mr NQN's is chicken and raw tuna. The banchan arrives on a large tray. 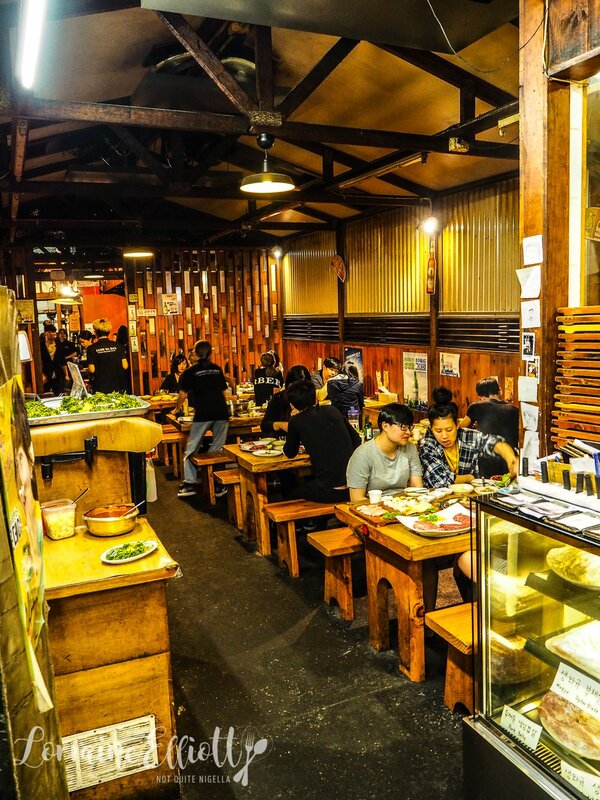 There's seven complimentary side dishes including bean sprouts, green salad, potato salad, daikon pickles, onion, kim chi and a new one for us with raw crab sashimi with a chilli sauce. We adore the raw crab (although truthfully it took us a while to get to it) and the sauce is especially delicious. The bean sprouts and salad is another favourite along with the sweet potato salad. I get started on cooking the mixed set with three meats: fresh pork belly, spicy pork belly slices and thinly sliced wagyu brisket. 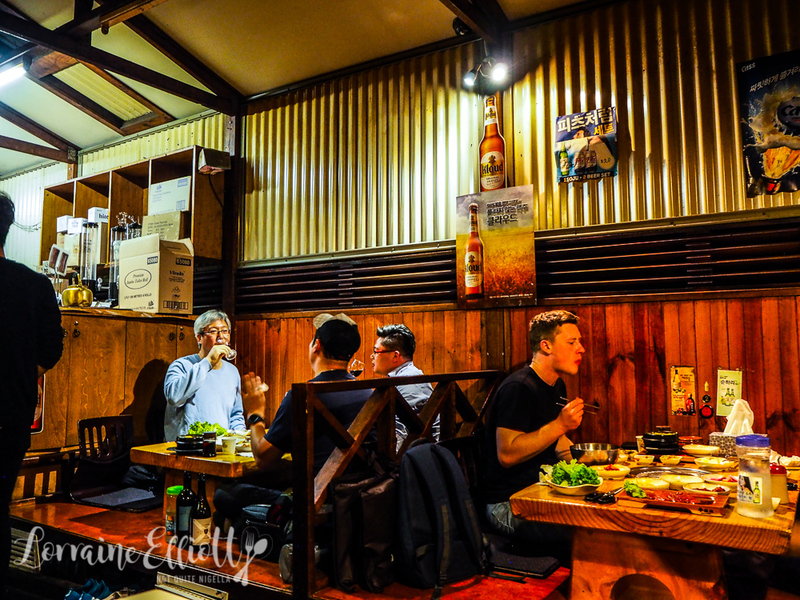 The fresh pork belly is very good especially dipped in the chilli sauce and wrapped in a lettuce leaf. I think I slightly preferred the very spicy pork belly slices because of the extra flavour from the marinade. 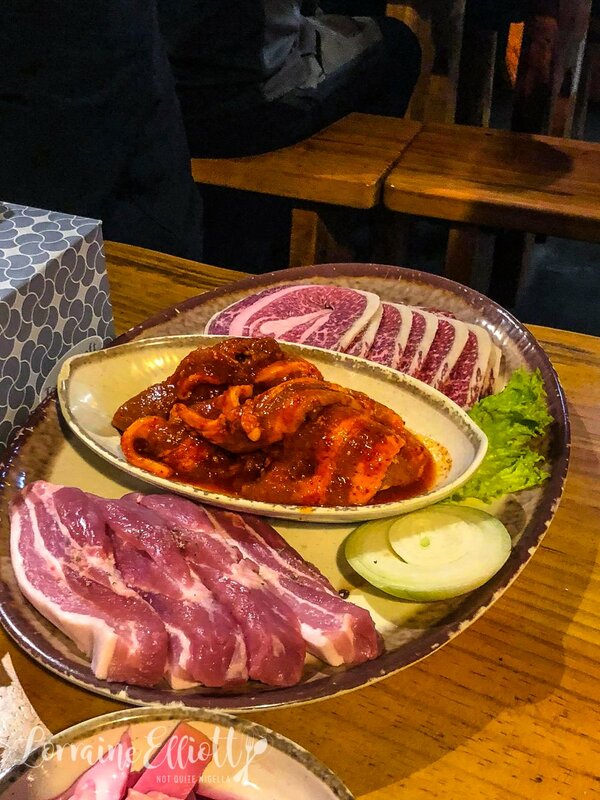 "I just don't want to try something where I could see tastebuds," says Ivy breathing a visible sigh of relief when she sees the thinly sliced beef tongue on the plate. I love beef tongue as it melts in the mouth and this is no exception. It's also a generous portion. 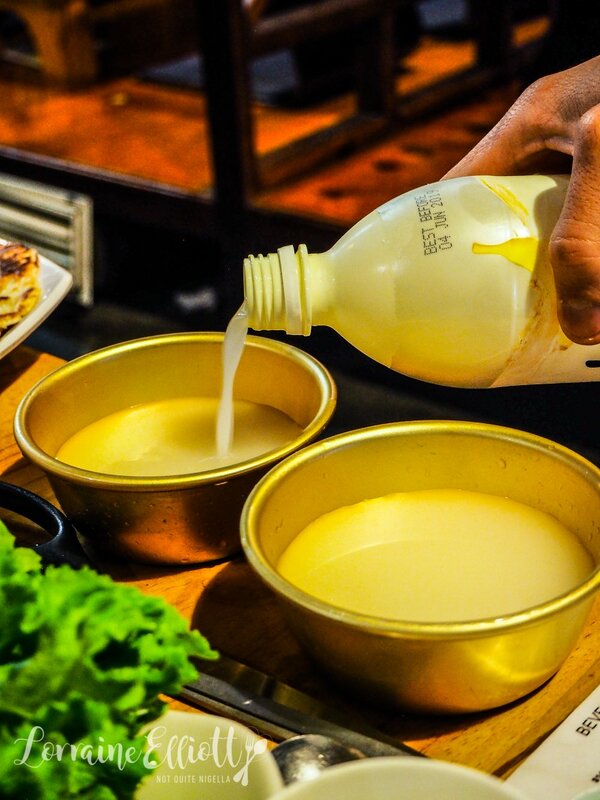 The cheese pork ribs are expensive at $40 especially compared to other dishes but I have a special love for the Korean special love of putting melted cheese on everything. 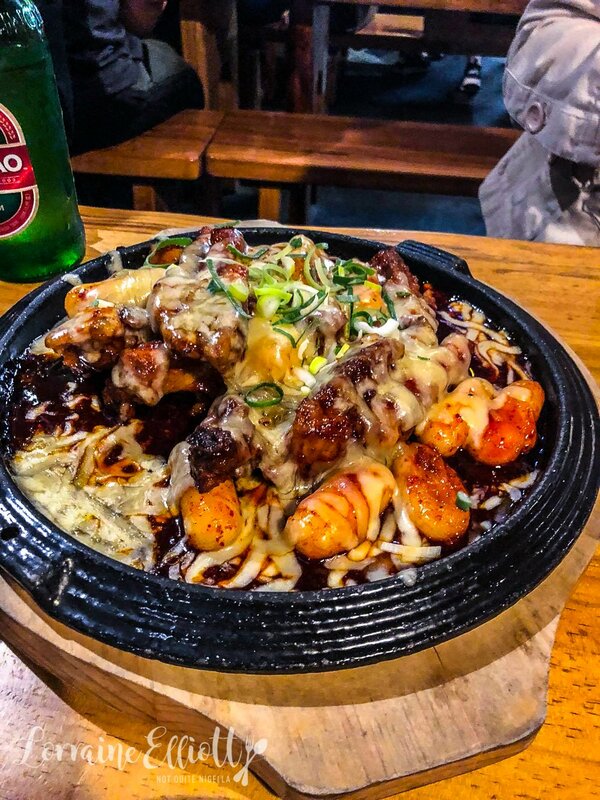 There's a generous amount of pork ribs and a few ttebokki although we could have more and the whole sizzling plate is covered with melted cheese. You can have this either mild or spicy and we chose spicy which I am going to warn you is spicy AF (and that comes from someone who doesn't find a lot of chilli hot) so please order the spicy with a warning. The best antidote to this is a cupful of the banana kook soon dang wheat and rice wine dubbed "sparkling rice wine" that Mr NQN ordered. It came with two chilled metal bowls and they shake it up for us to distribute the sediment in the bottle. It's cooling, sweet, creamy and refreshing and the cold metal bowls are genius and we all want to buy some of this to take home to drink. It's our discovery of the night quite honestly. And there is also a peach version but the banana is definitely the pick of the two as the peach is too sweet and quite artificial tasting. We also ordered the seafood pancake. 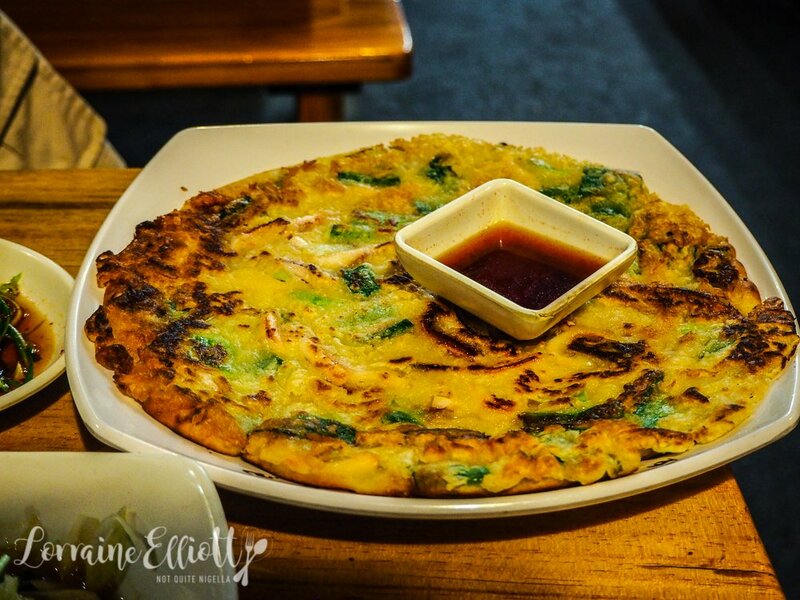 I love a crispy seafood pancake but this one is soft and quite floury. I didn't take more than two bites of this as I wasn't going to waste calories. There's no dessert so it's time to find it elsewhere. "We have around 200 people waiting for a table on busy nights," the friendly guy working there tells us as we pay and leave. He points at the screen with everyone's name. "They wait for 1 hour for a table for two," he says. He also mentions that they are opening one up near World Square in 10 days time but this one will be three levels. 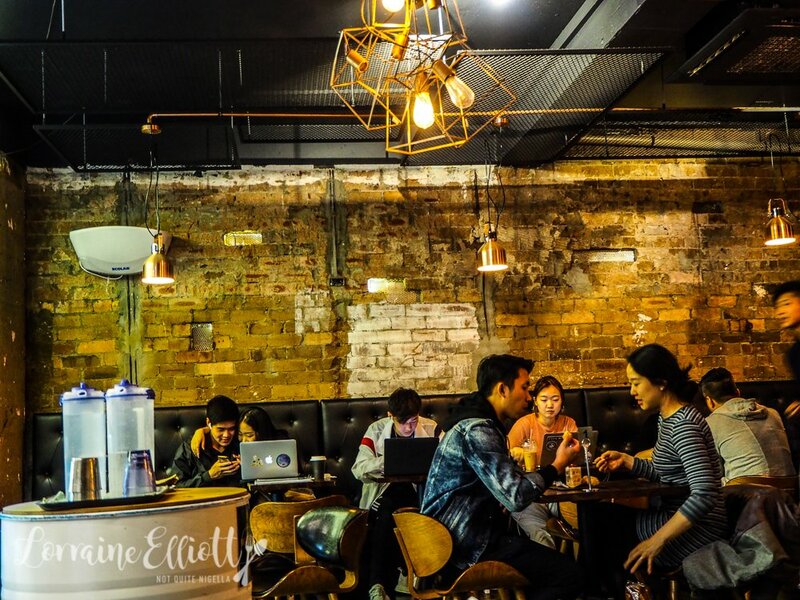 We find dessert just a few minutes walk away at Lab Bakery and Cafe towards Strathfield station. We grab a tray and try a few things that catch our eye including a long stick of brioche filled with cream and topped with crumbs. There's also a squid ink, walnut and lemon cream cheese bread and taro cake. 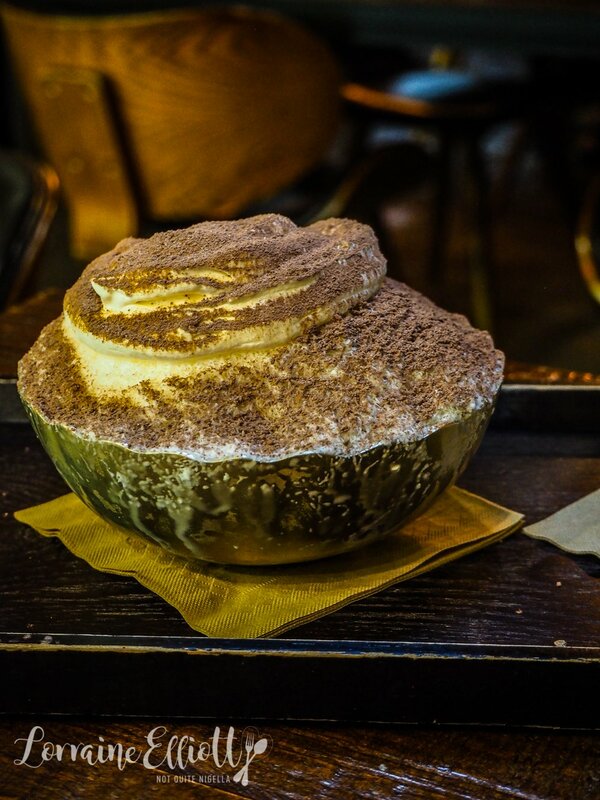 But our favourite is a tirabingsoo, a tiramisu bingso. Pat bingsoo is a traditional Korean dessert made with shaved ice and usually involves red beans and mochi squares. This tiramisu version is made with condensed milk ice, cream cheese and a layer or chocolate on top. The ice is so fine that it resembles desiccated coconut and we scoop and scoop although even the small one proves enormous. So tell me Dear Reader, what is your favourite land meat and sea meat? And do you avoid wasting calories eating something you don't enjoy?